OUCH! In a seven-minute whirlwind of Walcott and woe, the Champions League dream of beating a series of English teams to win Europe’s top tournament was over. It was seven minutes which summed up Arsenal’s experimental, topsy-turvy season. Moments of magic and promise, erased in the final finish by naive blunders and bad luck. There can’t be many teams who have played so well over a season only to end up with nothing to show for it but memories of Milan. Yet, the premise was always fragile: Wave farewell to Thierry Henry, spend thriftily in the transfer market, rely on teenagers who have never hit the final furlong in the lead before and keep fingers firmly crossed. Put it like that and it seems silly now that we even thought it might work. If Arsene Wenger had not been at the helm, we wouldn’t even have entertained the idea. Truth is, for all the pretty passing football, Arsenal have been living on their toes all season and it was always possible – or likely – that it would come crashing down. It just hurts that it happened in a blur of penalties that might and might not have been, and only seconds after Theo Walcott’s breathtaking 70-yard dribble. It mimicked Maradona butter-slicing an English defence, but also reminded us of that missing man: Thierry. It’s goals like that which should win crucial Champions League matches, rather than disputed penalties. But there is no hard grudge against Liverpool, even if the pubs of Camden and Islington were filled by Gerrard shirts mismatched with southern accents. It’s hardly payback for Michael Thomas and the “right at the end” championship of 1989. For the last 15 years or so, there has been an anybody-but-Man United truce between the clubs, which in recent years has been extended to Chelsea. Let’s be realistic: the manner of the defeat would have been even harder to stomach if it had been inflicted by one of the top two. Wouldn’t it be great if Liverpool now made John Terry blub again in the semis? Arsenal cannot really complain about the way it all evaporated, they have been escaping with injury-time goals all season, almost testing themselves to see what kind of trouble they can overcome. The recent Houdini trick at Bolton is the best example, but it can be traced back to day one when they needed a last-second goal to beat Fulham. 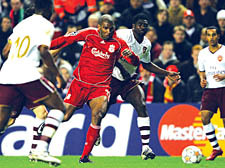 Gerrard’s late penalty at Anfield was a challenge too far. Defeat might make Wenger finally see the benefits in a bit of retail therapy. There is a need for a prolific striker that can stay fit all season, a commanding Tony Adams figure at the back and possibly a new goalkeeper. Wenger may argue he has Eduardo, Djourou and Fabianski in reserve, but those names are unlikely to satisfy the fans who will be hit with increased ticket prices next season. Yet who can really pick apart Wenger’s record? He stuck to the principle of winning in style and almost pulled off a triumph which would have been unthinkable at the start of the season, way back when Top Four Tottenham were boasting that they, rather than Arsenal, would qualify for the Champions League. From the evidence of that night in the San Siro, when for a brief moment Arsenal were on top of the world having put world champions Milan to the sword, the team just needs a little tweaking. As usual, it would be better to trust Arsene than the knee-jerk fantasy football managers in the stands. While it feels sore now, the supporters wouldn’t swap Wenger for Benitez, Fabregas for Gerrard, or the excitement and the rewards of the Champions League for a Rumbelows Cup and a season of playing the wannabes of Europe in the Wafer Cup? I’ll take the San Siro over that any day, even if it winds up in hurt.